For the fifth year in a row, Métis Nation of Ontario (MNO) Veterans’ Council Senator Dr. Alis Kennedy, O.ONT, CD, OMC, had the honour of being invited to the Remembrance Day ceremony at Queen’s Park by the Office of the Premier. During the ceremony, attendees were able to view a video of Premier Kathleen Wynne’s attendance of Remembrance Day ceremonies in Hong Kong, China. Premier Wynne spoke in a video message and afterward her partner, Jane Rounthwaite, placed a wreath at the memorial on the Premier’s behalf. 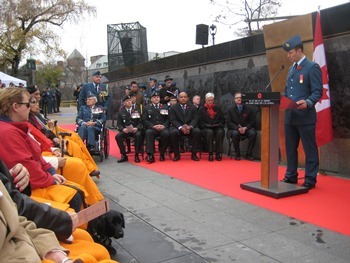 Speakers at the ceremony included Honourary Lieutenant General Richard Rohmer, Canada’s most decorated citizen; Michael Coteau, the Minister of Tourism, Culture and Sport; and Brigadier-General Lowell Thomas, commander of the 4th Canadian Division. Métis Nation of Ontario (MNO) North Channel Métis Council President Yvonne Jensen and Senator Blair Sterling attended the Remembrance Day ceremony in Blind River to honour local veterans by placing a wreath at the cenotaph. During the ceremony, a local resident captured a lovely picture of President Jensen as she humbly placed the wreath. 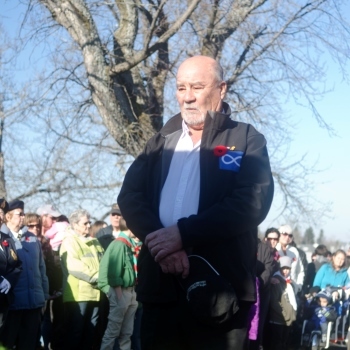 Métis Nation of Ontario (MNO) Senator Eugene Contant represented the MNO Northern Lights Métis Council during a Remembrance Day ceremony in Cochrane. Senator Contant respectfully removed his hat after placing a wreath at the memorial. The wreath was covered in poppies and shaped like a cross. The MNO Northern Lights Métis Council asked Senator Contant to place the wreath to honour all soldiers on behalf of the MNO. 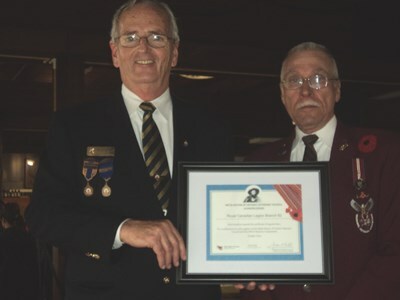 The Métis Nation of Ontario (MNO) Veterans’ Council recently presented a certificate of appreciation to the Royal Canadian Legion Branch 82 in Port Credit for their continuous support of Métis veterans. For the past five years during Remembrance Day ceremonies, the Métis flag has been included in the colour guard. According to the Legion’s website, the flags included in the colour party are the Canadian Flag, the Red Ensign, the Royal Union Flag (also known as the Union Jack), the appropriate provincial or territorial flag, the United Nations flag, the NATO flag, the Legion banner and flags that represent the Legion and the principles on which the Legion is founded. Including the Métis flag in Branch 82’s colour party is a great honour for Métis veterans. In 2011, the Royal Canadian Legion Branch 82 donated the first Métis veterans wreath that would be placed at the Port Credit cenotaph. 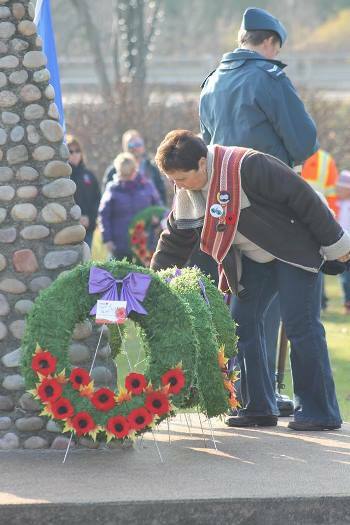 The wreath has been with the MNO Veterans' Council ever since. In addition, Métis veterans are proudly and publicly acknowledged when the Métis veterans’ wreath is laid at the cenotaph. “Royal Canadian Legion Branch 82 has and continues to welcome our Métis veterans as part of the Canadian fabric and their contributions to Canada,” said MNO Veterans’ Council President Joseph Paquette. The certificate of appreciation was presented to Branch 82’s President Bob Borre for their continued support. The Métis Nation of Ontario (MNO) Veterans’ Council attended the annual meeting of the National Council of Veteran Associations (NCVA) in November 2015, where veteran organizations are given a chance to put together a legislative program to be brought to the federal government’s attention. 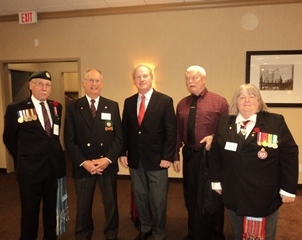 The MNO Veterans’ Council has been a member of good standing with the NCVA for six years. MNO Veterans’ Council representatives attend the annual meeting every year in Toronto to ensure that Métis veterans have a voice at the federal level. The representatives’ visibility and input are vital towards keeping a Métis presence at the meeting. 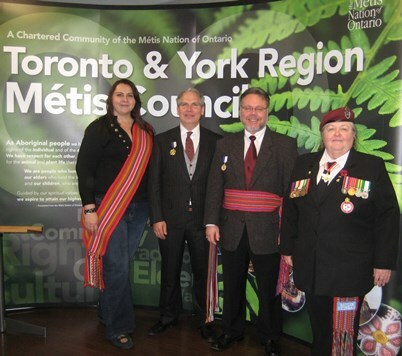 Ross, MNO citizen Réjean Michel, CD, and MNO Veterans’ Council Senator Dr.
On November 14, during Louis Riel Day celebrations in Toronto, Métis Nation of Ontario (MNO) Veterans’ Council Senator Dr. Alis Kennedy, O.Ont., CD, OMC, presented several MNO citizens with the Louis Riel Medal and certificates of appreciation. On behalf of the MNO Veterans’ Council, Senator Kennedy presented the Louis Riel Medal to MNO Toronto and York Region Métis Council (TYRMC) Chair Todd Ross. Afterward, Ross and MNO citizen Réjean Michel, CD, were both acknowledged as MNO veterans and presented with the Louis Riel certificate. The Louis Riel Medal and certificates confirm that Ross and Michel are both verified veterans within the MNO. Senator Kennedy also presented a certificate of appreciation from the MNO Veterans’ Council to Youth Representative Christine Skura, RN, for her written contribution to Fighting For Canada Before There Was A Canada: Ontario Métis Veterans Pass the Torch. Beaulieu received an appreciation certificate during the 2015 Annual General Assembly (AGA) for her submitted article about the MNO Veterans’ Council President Joseph Paquette and Skura interviewed and wrote an article about Senator Kennedy. The book was released in August of this year. The presentations were followed by a discussion about the MNO Veterans’ Council’s youth and veterans pilgrimage to Vimy Ridge. 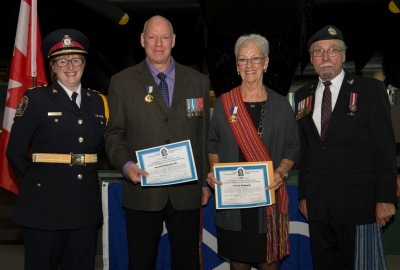 On September 25, the Métis Nation of Ontario (MNO) Veterans’ Council, in collaboration with the Belleville Police Service, presented the Louis Riel Medal and certificate to four MNO veterans. The presentation ceremony took place at a fitting location: the National Air Force Museum of Canada, located at Canadian Forces Base (CFB) Trenton. 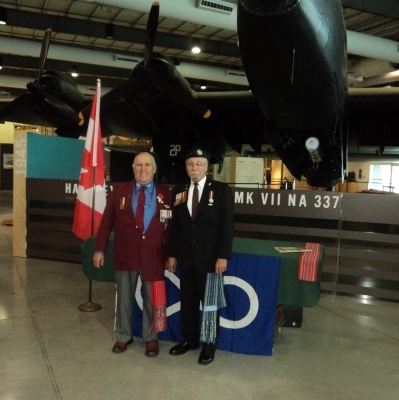 MNO Veterans’ Council Chair Guy Mandeville, CD, organized the venue for the ceremony. 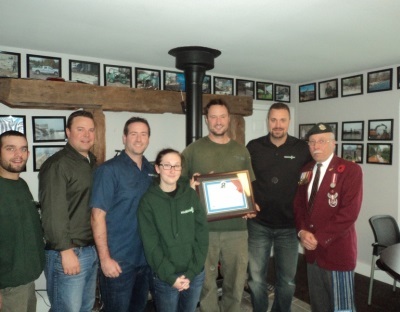 Paquette presented each veteran with the Louis Riel Medal and the accompanying Belleville Chief of Police Cory MacKay (left) holding a Certificate of Appreciation presented by MNO Veterans’ Council President Joe Paquette (right). certificate was presented by Belleville Chief of Police Cory MacKay. MNO citizen Clark Beamish, CD, was the first among those gathered to receive the Louis Riel Medal. Belleville Deputy Chief Ron Gignac, CD, was the second recipient of the Louis Riel Medal. Gignac’s wife Betty and their daughter Nicholette also attended the ceremony. The third and fourth recipients of the Louis Riel Medal were Yvonne I.L. Gebhardt and her son Donald Gebhardt, CD. After Yvonne received her medal, Paquette stepped aside and Yvonne presented her son with his Louis Riel Medal. Don’s wife Linda and his two daughters, Hannah and Laxi, were present at the ceremony. Council President Joe Paquette at the National Air Force Museum of Canada. Following the presentation of the Louis Riel Medals, the MNO Veterans’ Council acknowledged the Belleville Police Service for their support of MNO veterans. 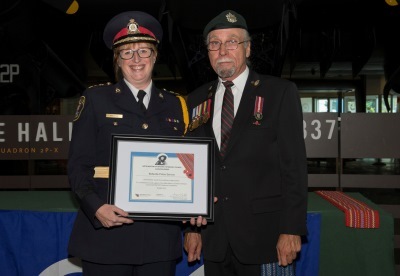 Paquette presented Chief MacKay with a Certificate of Appreciation from the MNO Veterans’ Council. The Belleville Police Service and the MNO Veterans’ Council have established a good long-term connection, working together within their community. “We must contribute towards healthy communities throughout our province,” Paquette said. The National Air Force Museum of Canada has a national reputation for having the largest number of aircraft on display. The presentation platform was placed in front of the famous, fully restored Handley Page Halifax aircraft. “It was quite the honour to display the Métis flag in the Trenton museum,” says Paquette. Mandeville and Paquette had the opportunity to visit the museum later in the day. The Métis Nation of Ontario (MNO) Veterans’ Council’s President Joseph Paquette and Sergeant-at-arms Rob Baskey were invited to attend the Take A Vet to Dinner event held in Orillia. Paquette and Baskey were sponsored by City of Orillia Councillor Ralph Cipolla. 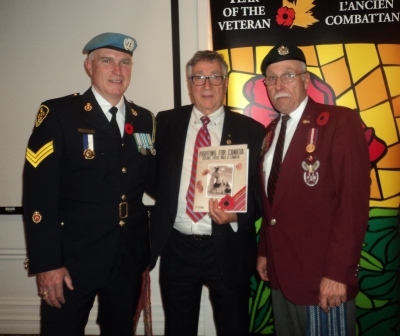 During the event, Baskey gave a short presentation on the MNO Veterans’ Council’s Vimy Ridge Project in 2017 followed by gifting Councillor Cipolla with a copy of Fighting For Canada Before There Was A Canada: Ontario Métis Veterans Pass the Torch, the MNO Veterans’ Council book. It was a great evening! Baskey and Paquette were very grateful to have a venue provided to showcase the MNO Veterans’ Council’s plans and activities. Veterans’ Council President Joseph Paquette (right). 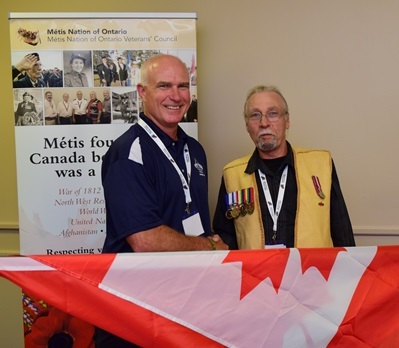 During the 2015 Métis Nation of Ontario (MNO) Annual General Assembly (AGA), the MNO Veterans’ Council held their annual general meeting where Rob Baskey was sworn in to his new position as the MNO Veterans’ Council Sergeant-at-arms. Baskey, a sergeant with the Ontario Provincial Police (OPP), began his career in law enforcement in 1990 with the North Bay Police Service. In 1995, he transferred to Mattawa, followed by working with the Provincial Violent Crime Linkage System (ViCLAS) Centre and the Orillia OPP Detachment, where he is currently the communications strategist for Community Mobilization and Engagement efforts. In 2012, Baskey was seconded by the Royal Canadian Mounted Police (RCMP) to be deployed in the United Nations Mission in South Sudan (UNMISS) to train, mentor and advise the South Sudanese National Police Service and the Government of South Sudan. The MNO Veterans’ Council is pleased to have Baskey’s experience added to their ranks. 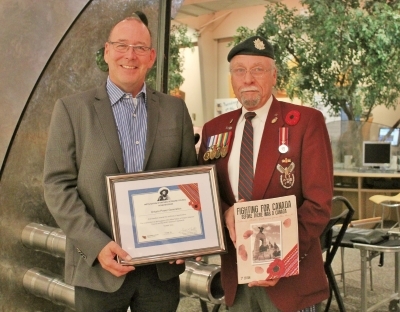 During the 2015 Annual General Assembly (AGA) in Midland, the Métis Nation of Ontario (MNO) Veterans’ Council launched the release of a new book, Fighting For Canada Before There Was A Canada: Ontario Métis Veterans Pass the Torch. The project that led to the book’s release began in the spring of 2013 and submissions by Métis veterans, veteran supporters and Métis youth were published in the book. MNO Veterans’ Council President Joseph Paquette presented certificates of appreciation to the sponsors whose contributions helped bring the book project into fruition. The sponsors--Nuclear Waste Management Organization, Ontario Power Generation, Hydro One Network Inc. and Techno-Metal Post—were additionally presented with copies of the book. Members of the Nuclear Waste Management Organization holding the certificate of appreciation and the Métis veterans’ book. 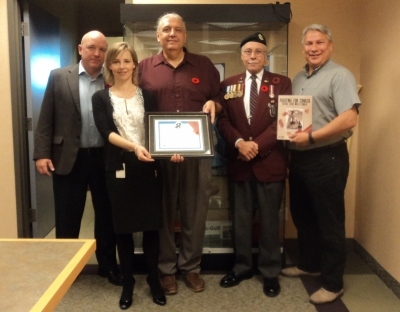 From left: Ross Holden, Senior Engagement Advisor, Aboriginal Relations; Lisa Frizzell, Director of Corporate Affairs; Bob Watts, Associate Vice-President, Aboriginal Relations; MNO Veterans’ Council President Joe Paquette; and Joe Gaboury, Director, Aboriginal Relations. 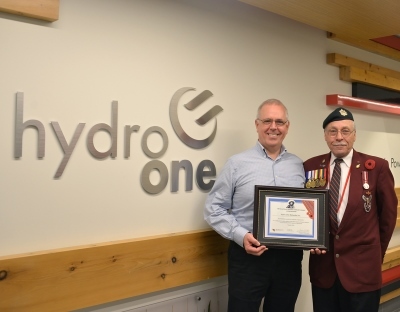 Scott Berry (right), Manager of Nuclear Issues and Waste at Ontario Power Generation, and MNO Veterans' Council President Joseph Paquette (left). President and CEO of Techno Metal Post Roger Lauzon (third from left) and MNO Veterans' Council President Joseph Paquette (right).